I will never promise to make a beautiful pie. Sometimes my pie crusts turn out a little goofy-looking, but that never affects the taste. I’ve never had any complaints! I once read in Cook’s Illustrated that King Arthur Unbleached All-Purpose Flour is the best flour for making flaky, tender pie crusts. I switched and haven’t looked back. It does make a real difference. I have been making an oil pastry crust that I got from the 1981 edition of Better Homes and Gardens New Cook Book for many, many years. I used to use canola oil, but lately I have switched to extra light olive oil. (The extra light means it has a very mild flavor, not that it is light in calories or fat.) With this recipe it is essential to use waxed paper for rolling the dough; it will be very difficult to roll out the dough without it. As a bonus, the waxed paper makes it quite easy to get the dough from the table or cutting board to the pie plate. 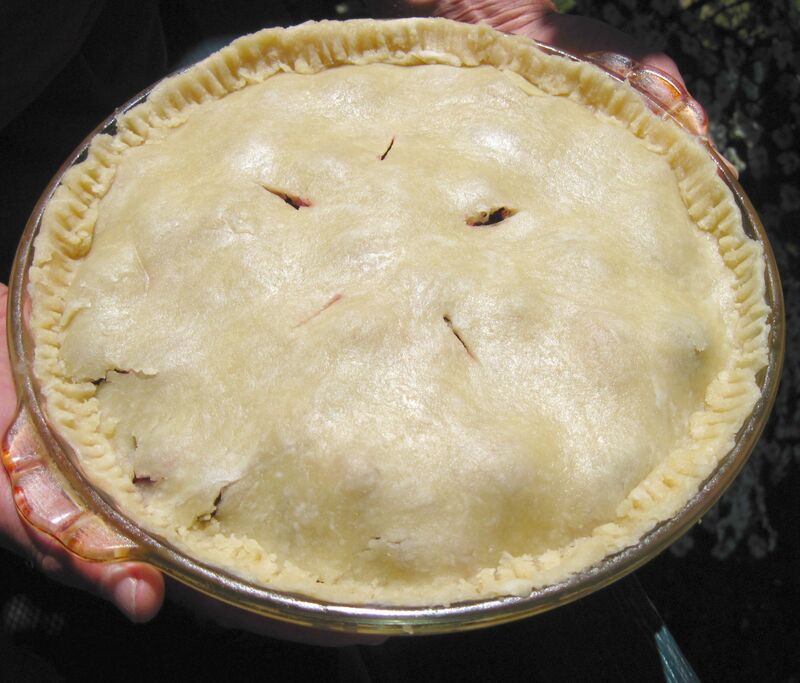 Here is my go-to pie crust recipe. 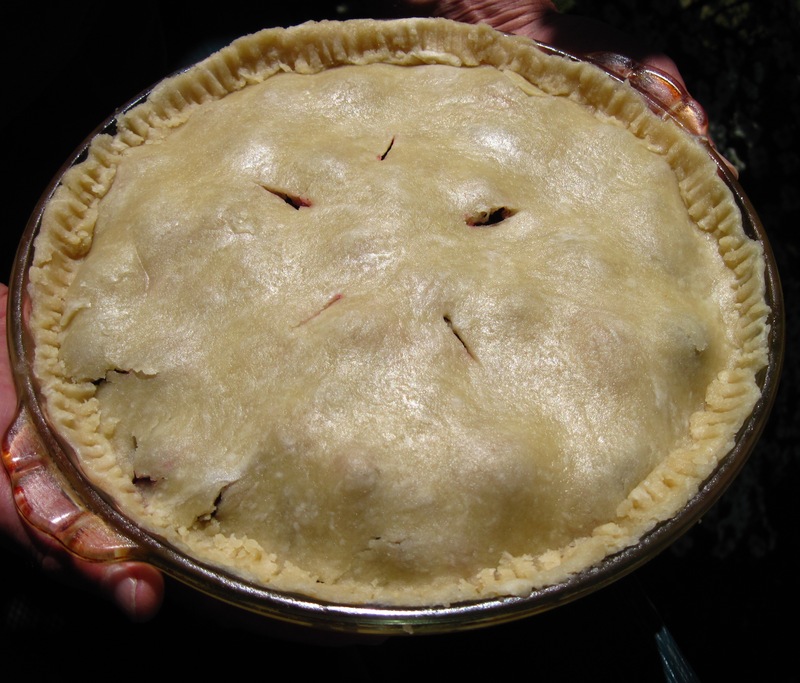 I use the double crust version for apple, blueberry, mincemeat, marionberry, and blackberry pies. The single crust recipe is for pecan and pumpkin pies. I highly recommend that you use a kitchen scale to weigh your flour. If you don’t have one, use this method to measure. First stir the flour a bit to aerate it. Then, using a large spoon, spoon the flour into the cup without packing it down. Keep adding heaping spoonfuls until the cup is overflowing, and then use a knife to scrape off the extra. You can see this method demonstrated in this video. 2. Combine the flour and salt in a bowl. 3. 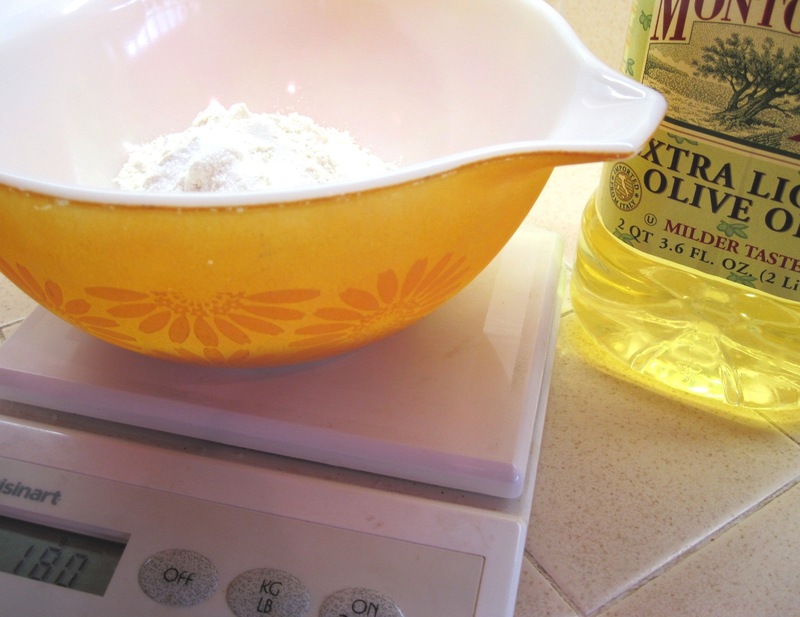 Measure the olive oil in a 1-cup measuring cup. Put the 6 tablespoons of milk in the same cup with the oil. Add the vinegar to the cup. 4. Add the liquids to the flour all at once and stir with a fork just until it can be formed into a ball. 5. Form the dough into a ball. Cut slightly more than half of the dough and put it on a 12-inch sheet of waxed paper. (If you put a little water under the bottom of the waxed paper, it won’t slide around when you roll out the dough.) 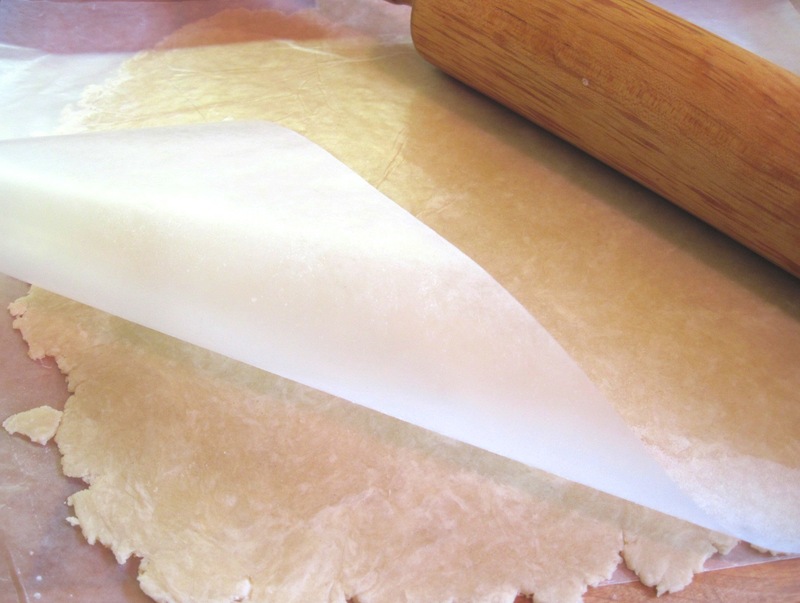 Flatten it with your hand; put another sheet of waxed paper on top and roll the dough out to the edges of the paper. 6. Carefully remove the top sheet of waxed paper. Lift the bottom sheet and dough up and put it paper-side up over the pie plate. Carefully remove the waxed paper and fit the dough into the pie plate. 7. Fill the pie with your filling. 8. 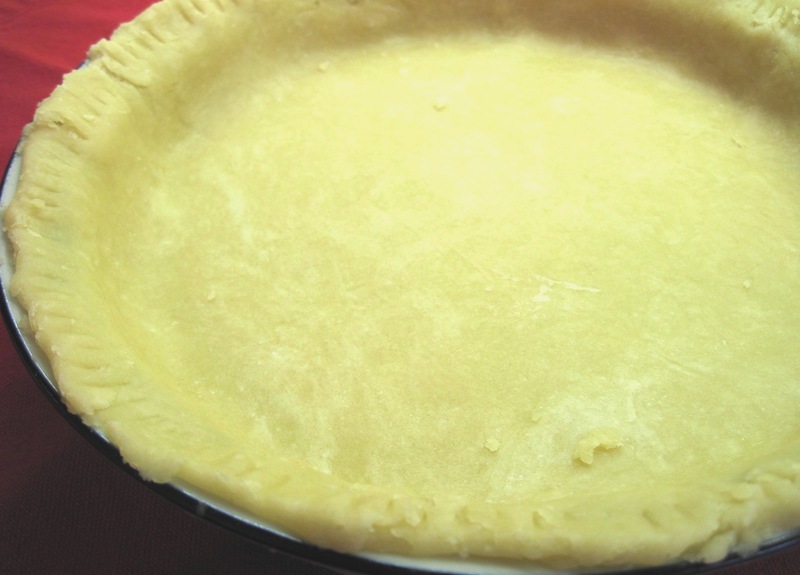 Roll out the rest of the dough between waxed paper for the top crust and place it over the pie. 9. Finish the edge of the crust the way you like. I simply use a fork to press into the dough around the edge. 10. Be sure to cut vents in the top crust before baking so that steam can escape. Use these amounts and follow the same procedure as above, rolling out all of the dough for the crust. Finish the edge of the crust before filling. I suffer from what I call- B.A.D. – baking anxiety disorder. My condition prevented me from ever actually making a pie, American kind at least, although I have lived here for a good 9 years. Might be time for me to try! I find that many people are intimidated by the thought of making a pie crust. If you let go of the idea that it has to look picture-perfect (you can see that mine are not) you can make delicious pies that are much appreciated by family and friends! you talked me into making that crust. It was too dry to stick together. Am I supposed to add the milk a little at a time? What are the tricks. I wish mine looked like yours! To me yours looks perfectly wonderful. but your pie does look very very good! Kath, we’re so glad you saw a difference in your pie crusts with our flour! That’s what we love to hear. Happy Baking! Thanks for your comments, Allison! 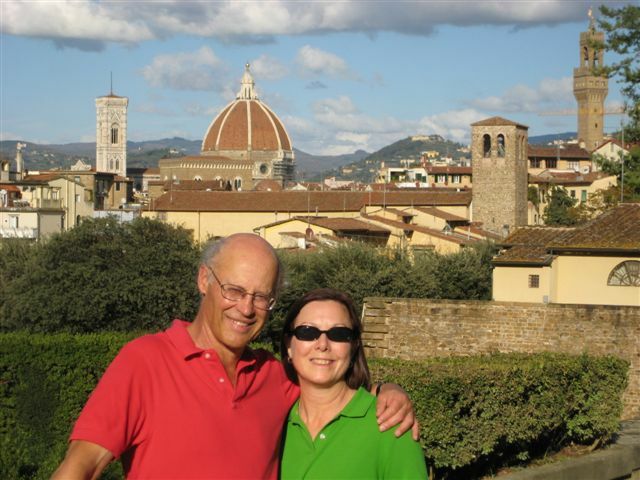 Hi Lisa – I am so sorry that it didn’t work for you! 😦 I really appreciate your comment to let me know. I’m certainly no expert, but this recipe has worked well for us for years. If your pastry was too dry to hold together, there was either too much flour or too little liquid. Assuming you measured carefully, I would guess it’s the flour. Flour can settle so it’s hard to measure precisely with measuring cups. It’s more accurate to measure by weight. In Ratio Michael Ruhlman writes that a cup of flour can weigh anywhere from 4 to 6 ounces. So the 2 1/4 cups of flour for this recipe could weigh between 9 and 13.5 ounces. That’s a big difference! After reading Ratio, I switched to using a kitchen scale for measuring flour. My bag of King Arthur flour says a serving is 1/4 cup or 30 grams. So for a two-crust pie that needs 2 1/4 cups of flour, I measure 270 grams into my measuring bowl. Since I’ve been using the scale I’m getting much better results! Hope this was helpful, Lisa. I hope you’ll give it another try. And thanks again, for your comment. You brought up a very important point and I just updated my post to add a tip about measuring flour. Why, thank you for letting me know you liked it! Hi , I am interested in knowing why you choose King Arthur flour? I don’t use it because that company simply will not certify their flour “non gmo”, I use organic Krogers or Arrow Mills or what is available organic. I am mildly interested in making all sorts of breads and have transitioned from box to all deserts from scratch. I DO know that flours are different and responsible for the textures we love when it comes to breads, cakes , pastries, etc. Can you give me any suggestions? I used to use Gold Medal Unbleached All Purpose flour, but I read the test results from Cooks Illustrated. They chose King Arthur flour as the best all purpose flour. When they tested pie crusts, Gold Medal crusts were tough, King Arthur crusts were tender and flaky. When I switched, I found their test results were absolutely right. I do care about buying food that is non gmo for the most part and did not know that King Arthur does not certify their flour as non gmo. However, pies are something that I make only a few times a year, so I want to use the flour that gives the best results.